During the past six decades FWE has been providing 'correction quality' equipment for institutions of all sizes and security levels. With equipment that exceeds all requirements for reliability and usability, FWE provides the virtually maintenance-free equipment that is promised by many of our competitors but rarely delivered. FWE has been counted on to serve tens of thousands of inmates every day in every type of environment imaginable. Whether your operation requires food transport carts for satellite feeding programs or bulk food holding cabinets, FWE has the equipment to fit those needs. Feeding inmates three square meals a day is just one of many concerns that those in the correctional industry have to deal with daily. Simply adding a 'security package' to a catalog is not enough to address those concerns. That's why we build our correctional units from the ground up knowing the environment they will be subjected to. With ultra-heavy-duty construction and tamper resistant features throughout, they are designed and built for the harshest conditions. The type of cart that will best suit a correctional facility greatly depends on which meal delivery service is used. 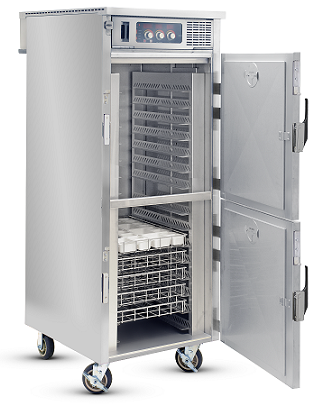 Transport carts are required for operations that pre-plate food on plates or trays in a central location and then deliver trays ready for consumption. When food is transported in bulk before being portioned onto serving trays or put on a cafeteria line, holding carts for pans and trays are needed. Typically a facility already has a considerable stock of correction prison meal trays; such as tray on tray, insulated trays, multi-compartment trays, flex trays and co-polymer trays. Models within the correctional series accommodate an extensive array of tray sizes, having information about tray size early in the order process allows equipment to be catered to the needs of specific facilities. 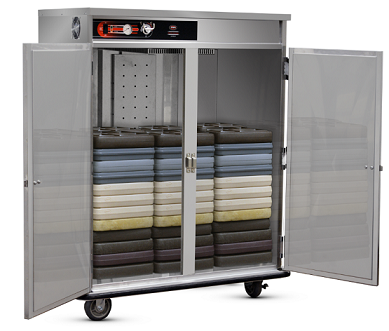 Tray transport carts are available in an array of sizes for various tray capacities and may be modified to house beverage dispensing containers. Cart dimensions are another important factor that needs to be considered for a correctional environment. Beyond making sure that units will fit through a doorway or into storage spaces, correctional facilities may require equipment that allows the person moving a cart to be visible. FWE takes these important security issues into consideration and offers mobile solutions that address the height of mobile equipment while still achieving high volume serving capacity. In the correctional environment, facilities need equipment that is going to be consistent, reliable, and sturdy. That's why we provide high-quality transport equipment, engineered and manufactured for security and extreme durability that is required. FWE Correctional Series is constructed of durable 18-guage stainless steel, with minimal removable parts. Our stainless steel, fully welded equipment offers long lasting solutions and is built from the inside out to withstand continuous, demanding use. Heat systems are built into units to help prevent tampering, loss or damage. Regular cleaning and sanitization is one of the best preventative maintenance measures that any foodservice worker can employ. Stainless interior and exterior make cleaning quick and efficient without the use of caustic chemical agents other equipment that may then be abused by inmates for other purposes. Research shows correctional foodservice operators prefer equipment with knobs and dials over tech-savvy controls. That's why FWE offers preset, concealed controls to eliminate any opportunity for tampering. System controls are upfront, easy to use, tamper resistant and do not require extensive training. When transporting food over ramps, through doorways, down halls, in and out of elevators, and across inconsistent surfaces, heated cabinets take a ton of abuse. Facilities need equipment that is built for transport and has structural integrity for long-lasting durability. FWE's exclusive tubular stainless steel base frame gives each unit a strong foundation. Casters are mounted to reinforcement plates for added durability and to absorb shock. 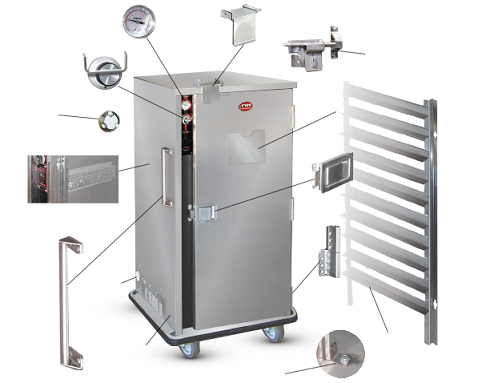 Many optional accessories are available to customize your cabinet, assuring streamline service when traveling from a central kitchen to dining location and providing tamper-proof solutions at various security levels. Not all features will apply and are dependent on which level HDM package you select and for which type of equipment. To learn more and for learn details on specific HDM packages, visit www.fwe.com/applications/correctional/hdm-features. FWE mobile equipment is counted on every day to serve thousands of inmates, performing under the toughest conditions, day in and day out. From the initial design, all the way through the manufacturing process, every piece of FWE equipment must meet rigorous quality control standards. Should any solution from FWE require more support, our network of service agents are always available should any piece of equipment be taken out of service due to misuse or excessive wear and tear. Contact www.fwe.com/sales-and-support/find-service. FWE has a wide range of equipment from heated holding cabinets and serving wells to retherm ovens, built specifically to meet your correctional needs. If your requirements are beyond the standard catalog offering, we most likely can build it custom. To learn specifics, see a full catalog of the correction equipment offered by FWE, additional photos and get a quote, visit: www.fwe.com/correctional. To speak to a sales representative about correctional equipment or other products that FWE offers, please contact sales@fwe.com.